Juji exposes the same API that powers our Web application to our users. Juji API is explorable and executable through GraphiQL in-browser IDE. Once you've logged in to Juji platform, you can access the GraphiQL IDE. This API reference covers only important concepts of using Juji API. 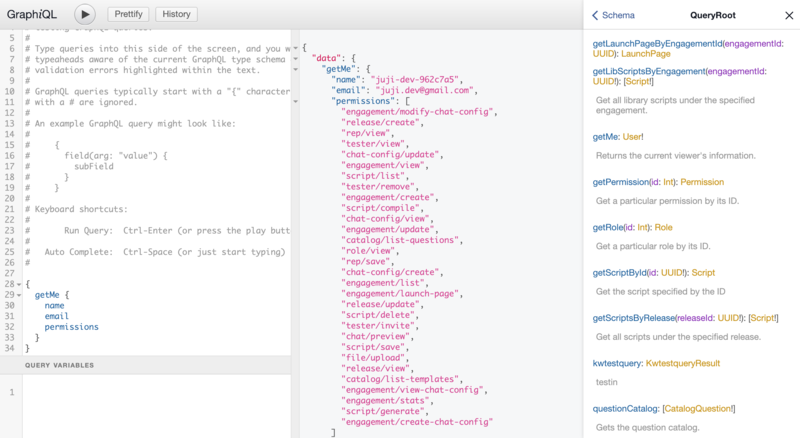 Please use the interactive GraphiQL to read the detailed documentation of all Juji GraphQL API calls. To effectively leverage the API, it is useful to understand the data schema of Juji platform. Juji data is organized with the following domain nouns. A brand is synonymous to an organization. An engagement is a chatbot project created under a brand. REP is abbreviation for Responsible Empathetic Persona. It is the identity of a chatbot, with a name and a personality. Each engagement has a REP.
A release represents a versioned deployment of one engagement. Thus an engagement may have multiple releases. This allows you to refine your bot without impacting your production release. REP often asks questions in a chat. Each question is associated with the namespace in which it resides, as well as a question id that is unique in that namespace. A participation represents one instance of a conversation by an end user with a REP. A participation is always associated with a release. Each end users answer to REP's question is recorded, along with the participation in which the question is answered. Juji's chat experience is built on top of WebSocket to push data to the client. This requires using GraphQL subscription to enable the server to push data to your client. Invoking a GraphQL subscription must be done over WebSocket because data will be streamed in and the connection must be kept open. Only first name is required, so that the bot can address the user. The returned JSON object contains two pieces of information needed to initiate a WebSocket connection to start the chat: participationId and websocketUrl. Failed POST request returns a JSON object with an error field with an error message string. A WebSocket connection with the server can now be established by doing a HTTP GET on the returned websocketUrl value above. A successful GET request will upgrade the connection to the WebSocket protocol, or an error message will be returned. Followed by REP's chat messages if this REP is configued to speak first, e.g. "text": "Hello, John! I am Juji, your virtual interviewer." text: "Hello, nice to meet you." where the pid field should has the same value as the participationId received. Consult the documentation of your GraphQL client library on the details of submitting GraphQL queries. Juji API data access operations require authentication. The authentication is based on JSON Web Token (JWT). Once you have created an account at https://juji.io/signup, to authenticate to the API, supply your email and password to the authenticate GraphQL mutation and request the token field in the response, e.g. where the variable input should be a JSON object with email and password fields. If successful, a JSON object is returned with a token, e.g. token: "a very long random looking string"
For all subsequent API calls, add the returned token in the Authorization header of the request with the string Bearer prefixed to the token. For example, if the returned token was abc then the Authorization header would be Bearer abc. Note that all API calls must be made over HTTPS and that as of now, the returned token is valid for up to 10 hours. Our API can return data in JSON, EDN as well as Transit format. The advantages of EDN and Transit are richer data types. With Transit you also get a more efficient over the wire format. GraphQL always returns a 200 HTTP response status code, so we have to rely on the errors field of the response to check for errors. Per the GraphQL specification, errors is an array of maps (dictionaries). Each error map will have the following keys message, category, kind and data. data is any valid JSON or EDN value and the other fields are all strings. There are four (4) broad categories of errors authentication, authorization, validation and unexpected. Within each category, kind explicitly identifies the actual error. Some computational intensive API requests are handled with Websockt, so the results can stream in when they become available. Since WebSocket requests cannot set custom headers, the JWT token should be sent as a query parameter auth-token. It is possible to access Juji's analytics capabilities without using the chat platform. However, the same authentication requirement for data access described above is necessary. Currently, we offer individual traits analysis, where our models infer an individual's personality and other individual traits using text that he or she has written. The input file is expected to be POST as a file field in multipart/form-data. The input file can be either a JSON or CSV file with corresponding file suffix. If the input is CSV, we expect the first column contains the identifier, and the second column contains a concatenation of an individual's written text as a single string. The CSV file should not have header. If the input is JSON, we expect an array of objects, where each object has two fields: id and text. text will be a concatenation of an individual's written text into a single string, and id be any string that is unique among the input rows/objects. The output is streamed back in CSV format, where the first row is the header with the names of the traits. The values of the traits are percentage. Juji does not retain the uploaded files, as they are immediately discarded after the output is returned.